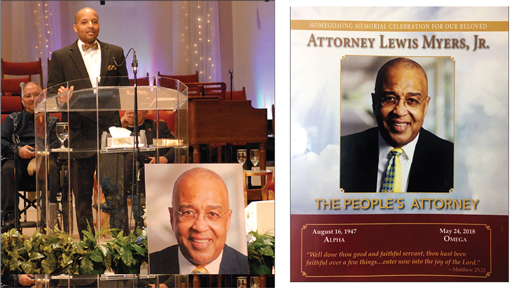 CHICAGO—Memorial services for attorney Lewis Myers, Jr., were held at Christ Universal Church on the city’s far South Side. Speaker after speaker spoke of his brilliance, his fearlessness and his devotion to the movement for the liberation of Black people. Next week The Final Call will devote extensive coverage to the attorney, who began his career in the late 1960s as a student activist. He served as legal counsel to America’s most prominent Black leaders, revolutionaries and organizations, including Nation of Islam Minister Louis Farrakhan, Rev. Jesse Jackson, Jr., Assata Shakur, Noah Robinson, Elmer “Geronimo” Pratt, the Wilmington 10, Rainbow-PUSH Coalition, National Action Network, NAACP, SNCC, SCLC and countless others. Atty. Myers, 70, died May 24 following complications from heart surgery. His life of activism was ignited in high school where he was elected NAACP Youth Council president and led a student demonstration that forced the Houston school district to comply with federal integration decisions. His funeral service was held June 9. Mr. Myers graduated from Howard University and received his law degree from the University of Mississippi. He filed the historic Ayers v. Mississippi case that helped desegregate colleges and universities. Berve Muhammad, a legal disciple of Atty. Meyers, delivered a eulogy on behalf of Min. Farrakhan and was lauded for doing an incredible job. Among other speakers were the Rev. 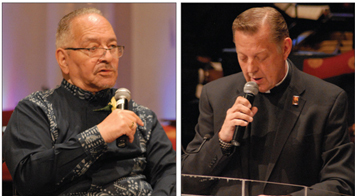 Jeremiah Wright, Father Michael Pfleger of St. Sabina Catholic Church, Rev. Ben Chavis, Dr. Carol Adams, Atty. Thomas Todd and attorney Janette Wilson of the Rainbow PUSH Coalition moderated the service. Atty. Myers was licensed to practice law in Mississippi in 1972. From that time until April, 1976, Myers was director of litigation at North Mississippi Rural Legal Services in Oxford, Miss. Later, the outspoken attorney was elevated to the position of Director of Litigation in charge of more than 45 lawyers and 40 paralegals. Between 1974 and 1976, he was on the cutting edge of filing more than six landmark lawsuits against county jails in the state of Mississippi for inhumane conditions and the treatment of their inmates that set precedents in the area of jail reform litigation across the country. Atty. Myers left Mississippi in April 1976, and later moved to Chicago where he was admitted to that state’s bar. He was affiliated with several organizations and is an adjunct professor of law with DePaul University School of Law in Chicago. He also taught at Chicago State University. Born in Houston, Texas, Myers attended the public school system and graduated from Phillis Wheatley High School. Atty. Myers tried hundreds of cases in jurisdictions all across the United States. He held memberships in a number of professional and non-legal organizations, including Alpha Phi Alpha Fraternity, 500 Black Men (Founder of Chicago Chapter), and the Black Men’s Forum. Atty. Myers was married to his wife, Tina, and the father of a son, Lewis Myers III.